The Blues Academy travelled to Cambridge to face the Cambridge University LX Club – the university’s second XV – at Grange Road. 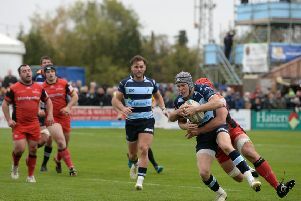 After a tight first half the Blues were 14-5 down, before playing some good rugby in the second half of an entertaining game to emerge victorious by 29 points to 24. The Blues started the first half with a series of infringements which gave the students the chance to gain territory and kick two penalties to go six points ahead. The Bedford pack were coping well against the older students’ side, but Bedford could not find a way through the students’ press defence. After 20 minutes, the Blues counter-attacked to give winger Ryan Hutler space on the right for a well worked try. Cambridge hit back with a penalty, and a well worked try from a set scrum to go into half time 14-5 ahead. The Blues upped the pace in the second half and began to work out how to beat the students’ defence. A short range try from prop Jack Culverhouse, converted by full-back Liam Shields, narrowed the gap to 14-12, before Bedford took lead on the half hour when second row Cameron Lawes drove over to make it 19-14 to the Blues. Immediately from the kick-off, the Blues infringed and Cambridge kicked a penalty to go to 19-17 ahead. However, the Blues hit straight back with some good rugby, and centre Jack Gibbs showed good footwork to score; Shields converted and Bedford were 26-17 ahead. Shields added a penalty to make it 29-17, before the students scored in injury time to make the final score 29-24 to Bedford. Blues Academy director Denis Ormesher said: “We conceded too many penalties in the first half but improved our discipline as the game progressed. He continued: “We were really pleased with the whole squad performance. All of the subs who came off the bench did well and made a real impact. The Blues Academy are next at home on Saturday when they take on Ealing Trailfinders Academy at Goldington Road, kick-off 2pm. Bedford: Charley Robinson (capt), Michael Bond, Jack Culverhouse, Sam Copeland, Jacob Moody, JonJo Fanning, Rahat Choudhury, Callum Strachan; Dylan Leney, Ben Phillips; Ross Taylor, Paul Aguele, Jack Gibbs, Ryan Hutler; Liam Shields. Replacements: Oliver Pescott-Frost, Ben Thompson, Cameron Lawes, Kyron Houston, Tim Herbert, Jacob North, Olly Howard, Jose Fernandes, Max Titchener.